With an average elevation of over 4,000 m, Tibet is considered to be the highest region in the world and is often called the "Roof of the World." This comes as no surprise, especially since southern Tibet is located in the Himalayas, which contains many of the world's highest summits. In addition to its incredible heights, Tibet is also one of the most isolated areas on earth, with most of the people living in elevations ranging from 1200 m to 5100 m. One of the most famous peaks found in Tibet is Mount Everest (8848 m), the highest mountain in the world. Tibet with it's mountains is the source and dividing line of the Asian continent's major rivers, with the Brahmaputra being the most important. Many of the rivers in Tibet can be used for hydroelectricity, but this potential hasn't been developed as of yet. 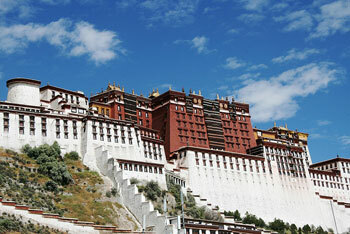 Tibet lies at the centre of Asia, with an area of 2.5 million square kilometers. The earth's highest mountains, a vast arid plateau and great river valleys make up the physical homeland of 6 million Tibetans. It has an average altitude of 13,000 feet above sea level. Tibet is comprised of the three provinces of Amdo (now split by China into the provinces of Qinghai, Gansu & Sichuan), Kham (largely incorporated into the Chinese provinces of Sichuan, Yunnan and Qinghai), and U-Tsang (which, together with western Kham, is today referred to by China as the Tibet Autonomous Region). The Tibet Autonomous Region (TAR) comprises less than half of historic Tibet and was created by China in 1965 for administrative reasons. It is important to note that when Chinese officials and publications use the term "Tibet" they mean only the TAR. Tibetans use the term Tibet to mean the three provinces described above, i.e., the area traditionally known as Tibet before the 1949-50 invasion. POPULATION: 6 million Tibetans and an estimated 7.5 million Chinese, most of whom are in Kham and Amdo. ECONOMY: Tibetans predominantly in agriculture and animal husbandry. Chinese: predominantly in government, commerce and the service sector.